When these polishes were first released, I saw so many positive reviews online and the thing that spoke to me more strongly than the words accompanying them, were the pictures. I was reading all this good stuff about how amazing they were and all I kept thinking was “but your nails look really bad”. MyFace Cosmetics Lil’ Bling* nail polish in Pink Champagne is an uber-metallic, high shine polish which benefits from a quick drying time and an opaque finish. Despite such a pale colour, I was done in two swift coats. On my hardy nails, wear was average with tip wear setting in on the 3rd day and no chips. All good things from a high street nail polish that costs less than £6.00. But the problem is, there just ain’t no denying that it makes my reasonably un-ridged nails look like McCoy’s Man Crisps. On ridged nails (or my toenails) this could get a whole lot uglier. MyFace Cosmetics Lil’ Bling polishes (£5.99) come in 16 different shades and are available online at MyFace Cosmetics or instore at Boots. Do you have any polishes that are awesome in nearly every way bar the most important? P.S. see my perpetually peeling index fingernail? Anyone got any awesome ideas to solve that problem? That’s a shame, I’ve seen these everytime I go in boots. The bottle sizes are good too. Maybe they could be a good stamping polish? re the peeling nail Trind Nail Repair has literally saved my nails. I buy mine from the Garden Pharmacy online- but i’m sure there is probably somewhere cheaper. I’ve gone from all peeling nails to nails that look like acrylics. LOVE it, no idea what I did before it! Your nails don’t look so bad, I’m more like ‘I love that colour!’. Unfortunately I can’t use a base coat with these as the finish goes funny otherwise I would have suggested a ridge-filling one. Maybe give them a good buff or falsies? I really like the Zoom Nail Food that HellCandy makeup once blogged about to help with nail health. Wow that’s a bad polish…bad, bad, Leroy Brown. It looks like Barbie was sick on them. Eh, won’t buy this then. Peeling nails are such a bummer, all mine are peeling like crazy. I’ve been taking supplements, using base coats, nothing helps. One idea is gently filing the surface of your nails so that the peeling bits sort of blend in with the other bits and that also helps stop the peeling or slow down at least. That’s a bummer, nothing worse than seeing you polish not perfect and highlighting the wrong. A ridge filler would help, but it just add’s on more time to the process. 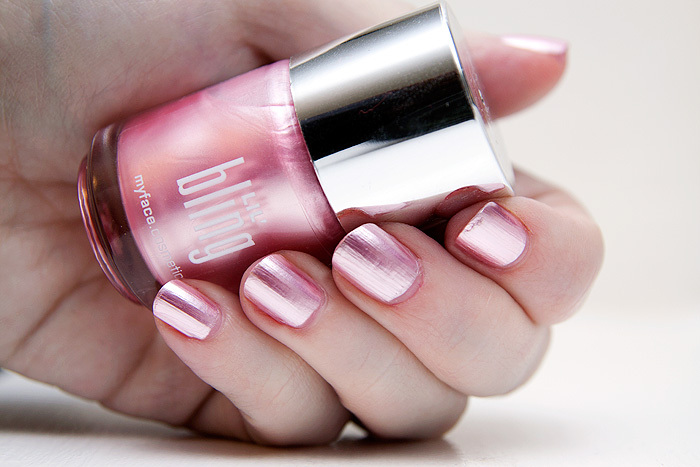 You should solar oil day and night for you nails =). Oh no! This is sad for sure. I hate when nail polish creates those ridges. Yuck. I have similar polishes that I used to use, they were Avon ones and had the same finish and they did the same to my nails and they are not ridged. Drove me mad, which is a shame as I love them, might try the Sally Hansen ones though. But like Meeta says these are useless with a base coat! Very sweet and pretty pink Colour. I know what you mean by the ridges on the nails. I think metallic finish polishes tend to do that.